As usual I didn't stick to my plan 100%. I like to think of it as being flexible. Yeah, that's it! My Friday Night Sew-In original plans were to mark, layer, pin-baste, and start quilting my Dresden Stars. 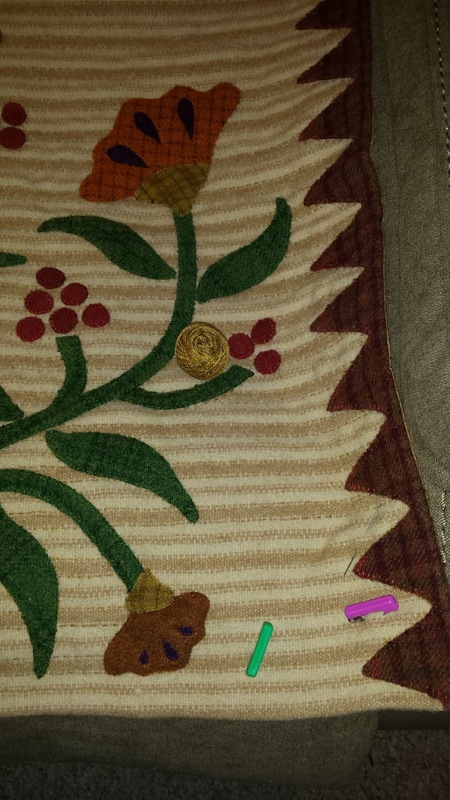 I followed the plan up to the quilting. I had to come up from my sewing room in the basement because my feet were like ice blocks from standing on the concrete floor for so long. At least I'm ready to make a go of it soon! Yay! By the time my feet thawed I decided to stay upstairs and catch up on a little TV viewing while hand sewing. 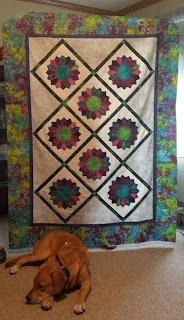 I pulled out my wool project and continued with my big-stitch quilting. I made great progress and am nearing completion. Only a few more partial rows left to go in the bottom right hand corner. I'll need to also sew up the bottom edge where this project was pillow turned. I'm loving this one! Sorry about the blurry pictures. When this one is done, I'll be sure to have clear ones to post! This is what I worked on last night. What did you sew? 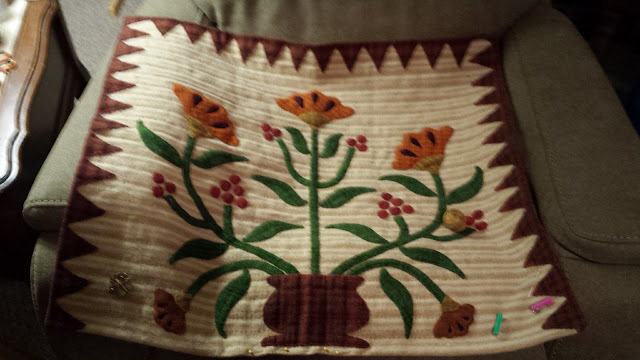 Wendy from Sugarlane Designs has posted that tonight is Friday Night Sew-In. Find out all the details HERE ! Although she's not been feeling well, she's still got prizes to give away! Go to her blog and sign in now! Remember this beauty? Well, I've got the set-in triangles marked for quilting and I know how I'm going to quilt the blocks. The backing is pieced, pressed and ready to be layered. 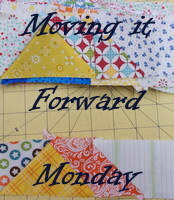 I'll run to my LQS for batting today and hopefully get this pin-basted and maybe a start on the quilting tonight. This is my FNSI project this month. It is also my APQ 2017 UFO Challenge quilt for this month - #12: Dresden Stars by Edyta Sitar. I can do this! I attended an all-day retreat a couple of weeks ago. Remember the previous retreat I discovered that I was short 5 blocks? 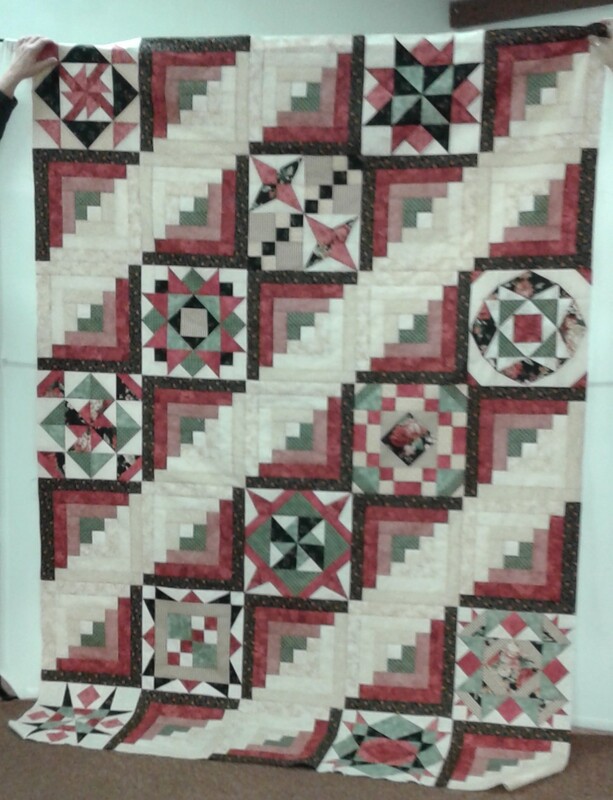 At this retreat I finished those last 5 pesky blocks to the Vintage Roses quilt. Then I thought all I had to do was sew them together but I got to looking at the pattern and discovered there is a pieced border. Thankfully it doesn't look too difficult -- just scrappy. I think that will do me for this post. I'll be back tomorrow to let you know how far I got on my FNSI/APQ 2017 UFO Challenge quilt! Happy St. Patrick's Day! Now get YOUR act together and join us tonight after your delicious corned beef & cabbage dinner! What a Slacker! or What? A Slacker? Lately I feel like I've been a slacker. As far as my APQ 2017 UFO Challenge goes? Very sorry. 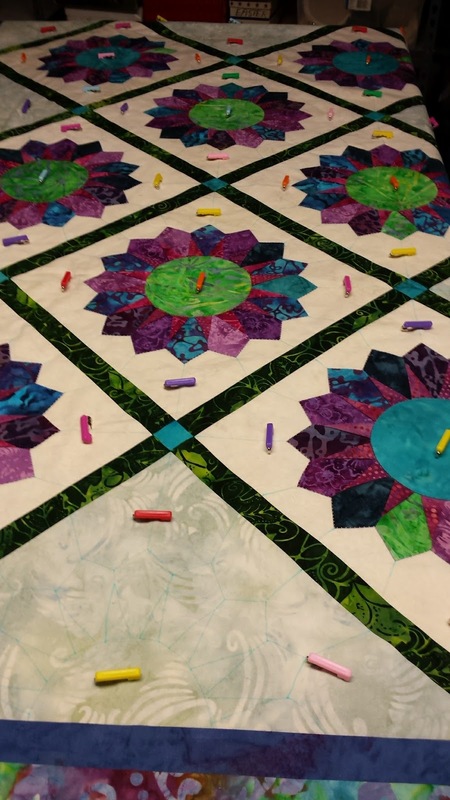 I was so excited because when I made my list of twelve projects to do, I mostly chose tops that needed quilting. 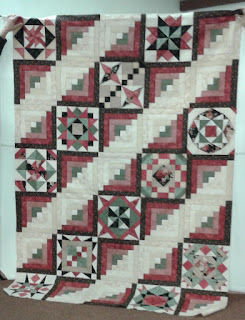 Wouldn't you know January's project was 30 completed blocks of my Jamestown Sampler! My first task was to put the blocks together. Then borders would need to be attached. Checked my box and I didn't have enough fabric for the inner border. I don't really even like putting on borders. LONG seams and HEAVY at that! Ugh! Two weeks ago I did make a purchase of fabric that should work for that inner border but that is all the progress I made since I shared that progress HERE! Big whoop, right? I will be going back to it one day ... this year, I hope! March's project is #12 on the Challenge List, Dresden Stars by Edyta Sitar of Laundry Basket Quilts. Last year I got the top 100% put together -- yes, that includes all borders! I was so excited that I pulled it all out. There was the backing fabric AND the binding fabric with it! YIPPEE!! I pressed the backing, sewed it together to fit the top, pressed it again, and laid it out on my cutting table. The top is also freshly pressed and I'm working on the quilting designs in my head at this very moment. 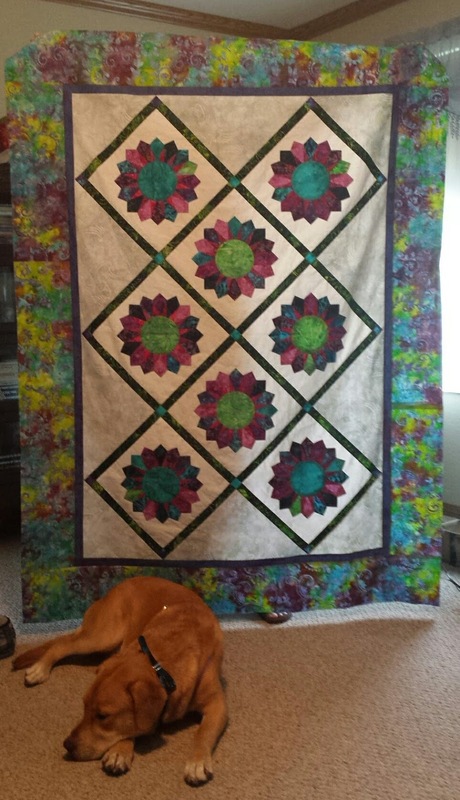 I may be close to actually quilting this one up. 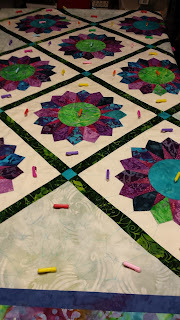 Maybe, just maybe, I'll have it done in time for my guild's quilt show this June! Fingers crossed! Last weekend I had a retreat with some friends. Remember this project -- Vintage Roses I believe it's called. I started this with a class through my guild after watching my friend Millie work on the same pattern at a retreat. I loved it then and I'm still loving it. Anyway I had a bunch of blocks completed and seven squares all matched up with rose fabrics and got them sewn. I was pretty sure that was the end of the blocks and I would be sewing those babies together. Wrong again! I checked my notes (I'm making it bigger) and I was 5 blocks short. 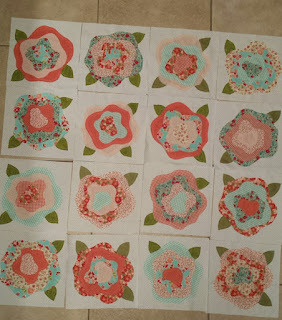 Next retreat I'll have five squares all matched up with rose fabrics and then I will be officially done with ALL the blocks! 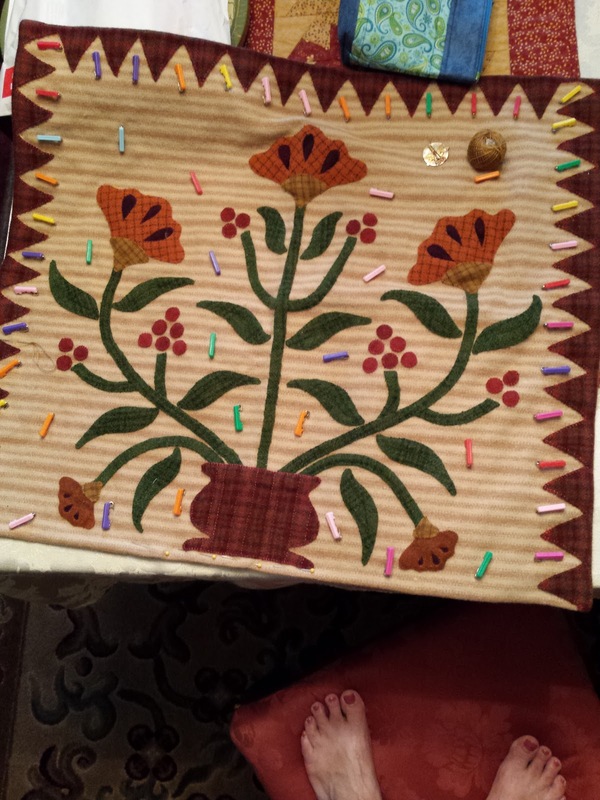 I've also been steadily working on this wool-on-wool applique wall hanging. 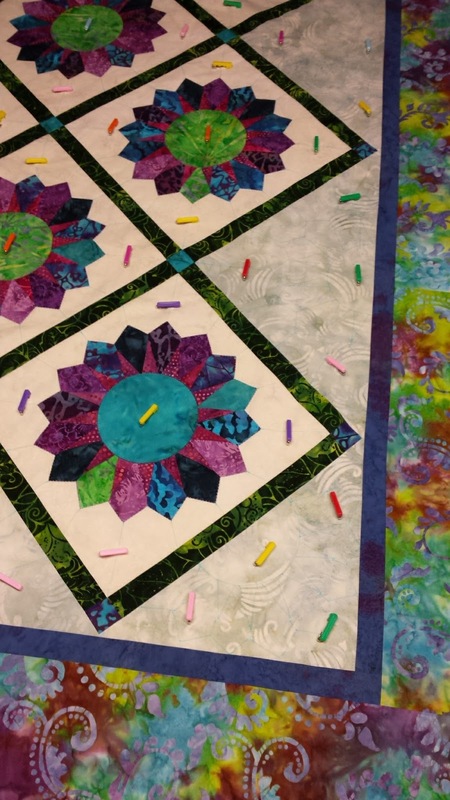 I started it when I took the class from The Quilted Crows with my sister. 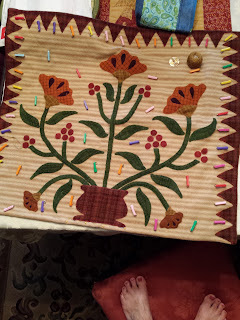 She wanted to learn wool applique and had a book written by these Australian girls. They've since split up to do their own things but it was a very fun class. Might be because I took the class in Grand Junction, Colorado ... The air is quite thin there so everything is suddenly a bit more fun! Ha! Anyway I'm nearly done with the hand quilting on this piece. Yay! I did manage to get quite a bit of knitting done lately too but I'll save that for another day!